Uttar Pradesh is waiting with bated breath as tomorrow is the day that will decide its fate for the next five years. This year’s assembly elections in five states have been more about power struggles than development of the state. The BJP is leading in every exit poll followed closely by the Samajwadi Party-Congress alliance. Amidst all the excitement, SP leader Ram Yadav Singh said the exit polls are influenced by the BJP. On the other hand, Akhilesh Yadav hinted at a possible alliance with the BSP. What do the exit polls suggest? How far will it match the reality set to unfold tomorrow? Are exit polls really influenced by governments? 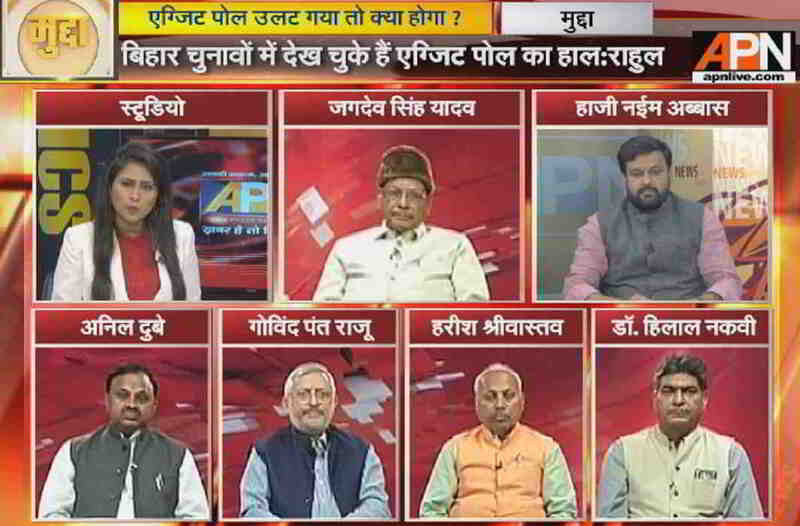 Friday’s edition of Mudda, APN’s daily current affairs show, discussed the issue. Moderated by Abhilasha Pathak, the guests were SP spokesperson Jagdev Singh Yadav, BJP spokesperson Harish Srivastav, Congress spokesperson Dr Hilal Naqvi, RLD spokesperson Anil Dubey, BSP spokesperson Haji Naeem Abbas and APN consulting editor Govind Pant Raju. “It is true that the method of the exit poll has changed. We cannot do a survey of 50 people and consider the set to represent a trend. Nowadays news channels ask reporters, relatives, political parties, etc., and consider their views. This is not an exit poll if we look at the technicalities… Ram Gopal Yadav’s political power is at stake. I don’t agree that they are influenced. There might be one or two who are influenced by a political party,” he added. Jagdev Yadav agreed that the BJP’s media management is good. “Exit polls are different in India and in America. Americans vote on the basis of development issues, not religion, caste and gender,” he opined. Hilal Naqvi dismissed exit polls and said we all will know the real result tomorrow. He alleged that the sample surveys used for exit polls by most channels are the same. “To join hands with Mayawati or not is Akhilesh Yadav’s personal opinion. We do not need anybody’s help,” he said. Even Anil Dubey agreed. “One cannot talk to 2,000 people and conclude anything definitive. What about the remaining 3 lakhs?” he said.